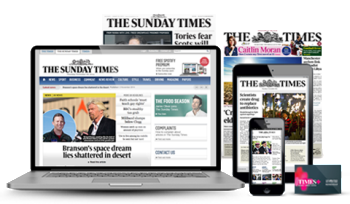 Avios has teamed up with The Times and The Sunday Times to launch a generous subscription offer. If you buy either newspaper then you will find this deal very interesting. There are four deals to choose from, as you can see here. Pay £7 per week (£364) and you receive the Classic 7 Day Pack. This is everything listed above plus The Sunday Times in print form. If you don’t want printed newspapers, the cheapest option is – oddly – more expensive than the cheapest print option! For £6 per week (£312) you receive The Digital Pack which gives you seven day access to the tablet newspaper. For £8 per week (£416), The Ultimate Pack gets you seven days of print newspapers plus full access to the tablet app. Purely as an exercise in buying Avios cheaply, this is clearly not the greatest deal ever. £260 for 20,000 Avios is still cheaper at 1.3p each than buying them from BA. I would not be a buyer at anything above 1p, however, unless you are topping off an account. On the other hand, if you currently pay for The Times, or would swap from your existing newspaper, it becomes more interesting. If you are self-employed, perhaps ordering a daily newspaper for your office could be a business expense. You can find full details on The Times website here. Have just looked at my BA Amex account and noticed that my Avios haven’t transferred to the Executive Club for quite some time. I thought this happened every month? Has somehting changed that i haven’t noticed? Thanks in advance and sorry for the slightly off topic! I had some arrive in my BAEC a day or two ago from my BA Amex. I’ve not noticed a problem – they seem to be going in every month as usual. So what’s the general opinion of using a pre paid card, yes or no? How could by not being able to pay for a subscription cancel enable an external company being able tp cancel your avios account? They can’t do anything but Avios could. After all, they don’t want potential partners thinking they’ll have their pants pulled down. At the end of the day, it’s all about risk vs reward. If you have a stack of avios, you’d potentially be putting them at risk. If not you’d probably be fine. You can use a prepaid card. For me the hassle of creating new accounts and risk of points being reversed (if using one’s own account) outweighs the upside. Personally this method would be a notch above simply exploiting a good deal for me to consider it, but I understand there are people that will, and probably not have any issues doing so. It’s hardly a risk free opportunity I admit, and will be a fair amount of aggro. Each to their own though, some are risk averse some not. I’ve downloaded the terms and there is 0 chance of legal action. The proposed path is not contractually prohibited. You have agreed a one-year contract with The Times. You have also agreed to Avios and The Times sharing personal data about you in order for your account to be credited with the 20,000 points. As this personal data may include your name and address, you are obviously exposed to some risk from The Times. I imagine they’d calculate the outstanding balance, send an invoice and if not paid place the account in default and pass it to a debt collection agency. Presumably Mr Murdoch’s minions do this all the time with broken Sky contracts. Have you read the contract? There’s nothing in there about defaulting. There’s no regulated credit agreement. Check out the terms for special offers, they’ve forgotten to create any for this promo. They have added the offer terms overnight. I would no longer advocate any of the above suggestions. Think they have people reading forums such as this one to change their terms so quickly. Why they don’t just put rewards will not be awarded for atleast 3 x Months after signing up, this would stop a lot of people trying it on in the first place. I’d be interested to know how either the times or a debt collection agency could obtain your contact details, given that all you need to sign up with is a name and an email address. As Rob mentioned above ‘you have agreed a one-year contract with The Times. You have also agreed to Avios and The Times sharing personal data about you in order for your account to be credited with the 20,000 points’. The only data you are sharing is your avios number. I asked their customer service yesterday if, by me giving a third party my avios number, they could access my personal details and she said no, due to the data protection etc. By the way I’m not considering doing this but the whole situation has piqued my interest in this subject. And who can blame them when there are scammers and swindlers around with such a sense of entitlement they think they should be able to take a bonus without upholding their side of an agreement.? I see the moral police have arrived to look down on us all daring to have a theoretical conversation. This is by far the best (very little known) deal for an online times subsciption – no Avios though. I think they keep it for when all else fails when people cancel and they try and persuade them otherwise – how I discovered it. It is – you just have to use the tool at the bottom to help you select the 6 pack edition. It even says min 3 months contract on that bit! initial term. Simply contact our Member Services team.